Type and Characteristics: Sea-going steam tug, built by Pusey & Jones, Wilmington, DE, at cost of $189,000, launched 14 March 1908, commissioned 15 November 1908, 880 tons displacement, 152ft long x 29ft beam x 17ft 6in draft, triple-expansion steam engine, 12kts, armed with 1-3in, crew of 53. Log Period and Areas of Service: 1908-34, NW American waters, North Pacific, Alaskan waters. 14 March 1908 – Launched at Wilmington, Delaware; sailed around Cape Horn to reach her new duty station, Neah Bay, Washington. March, 1909 – Assigned to search and rescue, fisheries patrol on the Swiftsure Banks, delivering mail to light ships and distant stations, patrolling regattas, towing disabled vessels, and other duties as required. 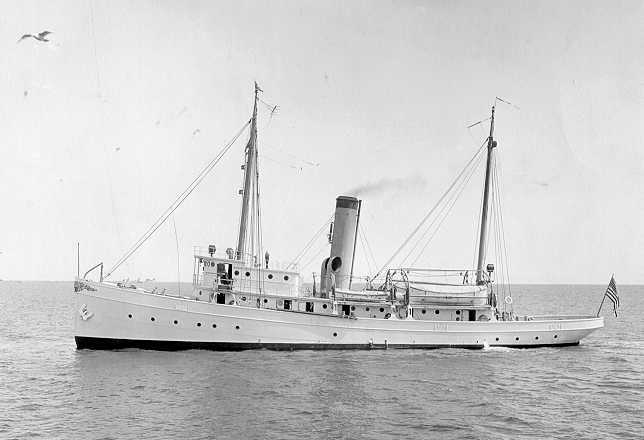 28 January 1915– Redesignated Coast Guard cutter CGC-16. 6 April 1917 – Transferred to the Navy for service during World War I. 28 August 1918 – Returned to Treasury Department control; service in the North Pacific area, where she was also involved in the seal patrol in Alaskan waters. April 1923 – 3-inch gun was installed at the Puget Sound Navy Yard.